When I lived in London, one night I met my friend for dinner. It was our think to meet once in a while over a meal and chat for a bit ( 4-5 hours). Whenever we meet, we talk for hours discussing our favorite movies, celebrity gossips, diets, clothes, etc. That night I couldn't not notice her hair. They looked more volume, shiny and beautiful. ''Have you change you hair colour again?'' I asked. ''No'' she smilled. ''Actually, I need to wash them,'' she continued. ''Thank you, it is because I used Batiste Dry Shampoo,'' she replied. That night I learned about dry shampoo and it's magical powers. Batiste Dry Shampoo refreshes hair between washes without using water. It’s is perfect for on-the-go consumers who want instant fixes and you can pick from a variety of refreshing scents. After few weeks I met my friend again, as soon as we sit and got our drinks she told me. And yes, it was my first bottle of Batiste shampoo. Since then I've tried few dry shampoos out there...from expensive to inexpensive, but so far Batiste is the best. Now, whenever Sveta comes to visit me to Paris, she always make sure she has for me in her suitcase at least 2-3 bottles of dry shampoo and of course gossip magazines, just to keep me on track what is going on in London. Sveti, thank you so much for being a friend to me in so many meaningful ways and for putting so much thought and care into our friendship. Dry shampoo is a lifesaver and your secret weapon for healthy summer hair. You can spend less by making your blow-dry last an extra day. Spray dry shampoo on to your roots, then leave it for a minute and brush well with a bristle brush. Oh, I remember that evening like it was last week.... I miss you Dusi and our catch ups.... Best times! 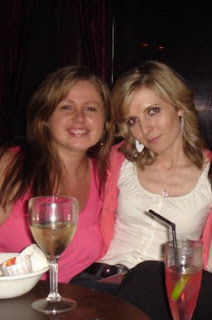 I am so happy that we are friends and have been since primary school... Can't wait for your London visit! I do swear by the dry shampoo(orignal one is the best for me)and all my friends live by it! The best thing about it is that the longer you apply ( a few days without washing) the better hair look!!! I'm following you now on GfC, Bloglovin and Facebook. Please follow back and like my Facebook page. I also use this. It's works very well. Thanks for visiting and following my blog. Follow you too now :-). Hi Cristina, I know what you mean. It's a shame it's not possible to buy it everywhere. Since I left London, the only way I'm getting Batiste is, when my friend Sveta send it to me. Also, thank you for following my blog. Hi Kate, yes, dry shampoo is great in between washes. 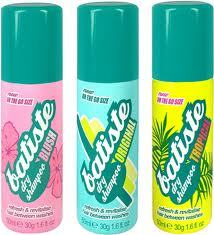 For me, Batiste is so far the best. http://closet2fashion.blogspot.comlove what your blog is about..